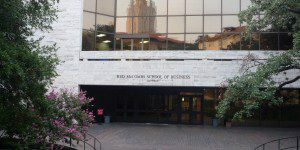 McCombs offers a Working Professional Evening MBA program at its Austin campus. The UT Austin Evening MBA offering allows students to pursue an MBA while continuing with their career. The 48-credit curriculum can be completed over 2.5 years. Classes are held Monday and Tuesday evenings from 6-9 p.m. The UT Austin Evening MBA program covers integral business values and skills like teamwork and leadership skills, business ethics, effective communication and problem solving abilities. This is a lock-step, cohort-based program that allows students to build a strong business network, and work closely with the majority of their peers in the program. At the beginning of the first semester, students are put into study groups of four to six people. Each student is also assigned a mentor from the previous year’s class to provide guidance. The program stretches over the course of seven total semesters. The class currently has 73 students that are, on average, 29-years old. Students in the program have an average of six years of work experience and an average GMAT score of 635. Their average GPA is 3.34 and they are composed of 22 percent international students and 32 percent of students that identify as women. MBA students at McCombs have access to the Career Management Team. With the help of the Career Management Team students can connect with McCombs’s alumni network, receive personalized career guidance and attend networking receptions and career fairs. Career planning is also built into the curriculum of the full-time MBA. During the first year students take a class called Strategic Career Planning. This class is meant to prepare students to make career choices and help them achieve their career goals. The class teaches students skills like interview training and marketing and networking techniques. The class of 2020 UT Austin Evening MBA program at Austin costs a total of $110,460. This includes tuition and registration fees, all course materials including an iPad, foreign travel insurance, lodging and meals during a global residency, career management advisors and recruiting events, workshops and meetings with career coaches and a guest speaker series. This cost is paid in equal installments over the whole program, usually due six weeks before the semester begins. A $2,000 deposit is required once applicants accept admission. Non-residents of Texas will have to pay an additional $2,600 each semester. Applicants to the UT Austin Evening MBA program at the McCombs School of Business must have a Bachelor’s degree or a comparable degree from a foreign university and two years of professional work experience. The application process is completely online. Applicants submit a completed application, official transcripts, GRE or GMAT scores, a current resume, one professional recommendation letter, and a $200 application fee. Students must also submit two required essays and may submit and additional optional essays. The required essays asks the applicant to explain their motivation for choosing McCombs and to introduce themselves to their fellow students. The introduction can be completed in one of two formats: a 250-word essay or a one-minute video. The optional essay is an opportunity to explain any area of concern with your application.